Proofing is the MOST Crucial Stage of Your Print Order! Attention to detail is the key to successful proofing. This checklist will help you make sure your checking your proofs thoroughly. Is any type dirty or broken? Are photos positioned, cropped and scaled correctly? Are text and graphics in the right places? Is the trim size correct? Are elements appropriately aligned, especially at the tops and bottoms of sections or pages? Please look over the proof very carefully for any spelling or typo errors. 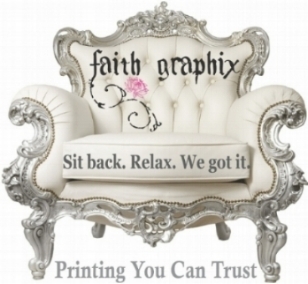 Please note that when you send back an email stating it is OK to print, Faith Graphix nor will the factory be liable for any typos or errors. PLEASE PROOF CAREFULLY! Once you approve your proof, full responsibility for the accuracy of the copy, size & positioning of the imprint is YOURS. Please pay particular attention to spelling, addresses and phone numbers. Online proofing is to show color and/or color breaks, but IS NOT an exact color matching system. Output from laser & ink-jet printers or what you view on your computer monitor cannot be matched. These methods are subjective and may not accurately represent your final printed product. While we do our best to ensure that every project is done right, only you know your project well enough to make sure all the elements are in place. We urge you to take the proofing phase seriously and check every document carefully. Once you have signed off on a final proof, you are giving us authorization to proceed with printing. After you have given us the approval to proceed, we will not re-print your job for any error you did not notice. We suggest that you enlist in the help of a professional proofreader. We suggest that you enlist in the help of a professional proofreader. Professional proofreaders are editing experts. They are trained to locate and correct errors in written work and to enhance the quality of the documents that they review. Proofreaders search for technical errors, and eliminate them. Included in the price of all items is an electronic proof (unless otherwise noted, mainly for promotional items). Electronic proofs are not intended to be accurate for color. In fact, we can safely say that the color won't match the printed piece you receive as we cannot guarantee the printed piece will exactly match the colors on your screen or printer. PDF: PDFs (Portable Document Format) are files created in Adobe Acrobat Distiller and readable with Adobe Acrobat Reader. PDFs are rapidly becoming the industry standard for file transfer and are our preferred format. Color fidelity of PDF files is affected by monitor calibration, lighting and use of Pantone® colors (Pantone® colors do not always appear as true on your screen). Therefore the color you see on screen may not appear as they do in print. However, PDFs provide a reasonable means for checking the accuracy of your files for print. Adobe Acrobat runs on both IBM and Macintosh platforms and can be downloaded for free from (click here>>). Mail us back your approved proofs as soon as possible so that we can begin printing. If you have corrections, you have two options: 1) you may make the corrections yourself and send us new files.. 2) We can make the changes for you. We will quote you on how much the corrections will cost. Production for your job will not begin until we receive written sign off on the proof.